On a pack trip everything from your luggage to food for people and horses, tents, bedding and other equipment is packed on pack animals. The only items found en-route is usually water and firewood and such food as can be purchased from locals. The pack animals are usually horses but can range from mules through yaks to camels depending on where you are. 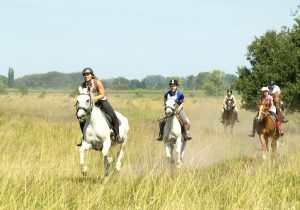 Historically all horseback trips of more than one day were by necessity pack trips or wagon trips. Ancient trade caravans were he pack trips and the global distribution networks of their day, overcoming the great natural barriers of mountains and deserts. Most of these routes are served by multilane highways now, or simply by passed with air or sea traffic. Fortunately for us there are still vast parts of the world where pack trips and travel on horseback or foot are the only ways to explore the wilderness. Pack trips are particularly suited to rough terrain where wheeled vehicles struggle to gain access. In fact the first wheeled crossing of the continental divide in the USA did not take place until 1827 when a wagon track was made across the Rockies to Utah! One of the most appealing part of a pack tip is the opportunity to spend 24hrs a day with the horses. Your horse becomes a true friend and trusted companion, taking you up and over steep passes, through lush valleys, across clear rivers, covering a far greater distance than a person could on foot in one day. Perched atop your sure-footed horse, with no need to watch your feet carefully, you can take in the awe-inspiring nature all around at leisure. Packing horses for a pack trip is a real art one which is dying out today. The weight has to be carefully measured so it is not too heavy and evenly distributed. The packs must be tied down so they don’t shift when the horses climb and descend steep slopes or scrape by trees or rocky cliff walls. Keeping everything dry is another essential – the water does not only come from rain showers but potentially from the rivers that need to be crossed on wilderness pack trips. As pack trips are most suited to rough country, they usually take place in wilderness areas with outstanding scenery. Typical areas where pack trips are the best (or often only) way to get around are the massive wild mountain ranges and plateaus on each continent: vast tracts of the US Rocky Mountains and the South West, Yukon territory, the South American Andes Mountain ranges, the Central Asian historical trade routes along the Silk Road over the Himalayan plateau also knows as 2the roof of the world" through eg. Kyrgyzstan, Kazakstan, Tajikistan, Tibet and Mongolia and the roof of Africa: Ethiopia. On these back to nature trips you are surrounded by spectacular mountain peaks, often snow covered, with only wildlife for company. The wilderness areas are so unpopulated and rich in wildlife and game that it is not hard to imagine you are living 200 years earlier (until you take out your solar charger for your satellite phone or slip into your hi-tech thermal clothes!). In North America pack trips into the Grand Canyon descend from the rarely visited north rim. As you descend below the rim away from icy winds the temperature becomes noticeably warmer – there is a micro climate on these plateaus which ranchers have used for years to overwinter cattle as experienced on our Arizona, Grand Canton Winter Pastures. The Andes Mountains run the length of South America and form a truly formidable barrier between the east and west coasts of this country. Riding from one side to the other means negotiating vertiginous paths, high passes and the clear thin air of high altitude so loved by the Andean condors who sweep past with their 10ft wing spans. When crossing from Chile to Argentina on the historic route taken by San Martin when liberating Chile form its colonial rulers, you pass the base of Aconcagua, the highest point in the Americas. The Ecuadorian Andes are marked by paramo vegetation (way above the tree line), many snow-capped volcanoes and deep volcanic lakes. The pack trip to Pinan Lake is a classic wilderness trip not soon forgotten. The central Asian Mountains and Himalayan plateau are part of the highest land mass in the world, also known as “the roof of the world”. The nomadic occupants of the Eurasian Steppes domesticated horses around 3500 BC. They developed the chariot, wagon, cavalry and horse archery and introduced innovations such as the bridle, bit and stirrup. These innovations rapidly crossed the steppe lands and were copied by settled peoples bordering the steppes. The resulting horseback armies spawned empires from the Cimmerians in the 7th century BC and culminating in the great Mongol empire started by Genghis Kahn in 1209. The word’s greatest trade routes, collectively called the Great Silk Road linked East and West in trade across the roof of the world. Today you can still ride along these ancient routes taking all your necessities with you on pack animals: horses in Kazakhstan, Kyrgyzstan and Tajikistan; yak in Tibet and camels in Mongolia. Last but not least the majestic Bali mountains, home to the nomadic Oromo people of Ethiopia is justly known as the roof of Africa. 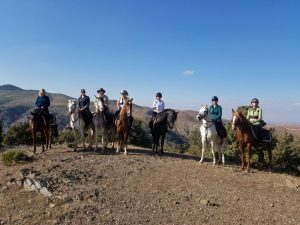 With a multitude of wildlife from Abyssinian Fox and to the majestic Lammergeyer (bearded vultures) which soar in the thermals, this high-altitude pack trip on the small tough local breed horses takes you through one of the most unusual destinations with a horse culture on the pack trip Abyssinian Explorer.